Effective teeth cleaning techniques and regular dental hygiene is an effective way to keep your child free from tooth decay and gum disease. At About Smiles Kids Dental, our patients are enrolled in a program where we see them every 6 months for an examination, clean and scale, floss, fluoride treatment and if necessary, x-rays. This way we ensure your child has minimal plaque levels and do not accumulate excessive tartar, which is difficult to remove with everyday brushing. 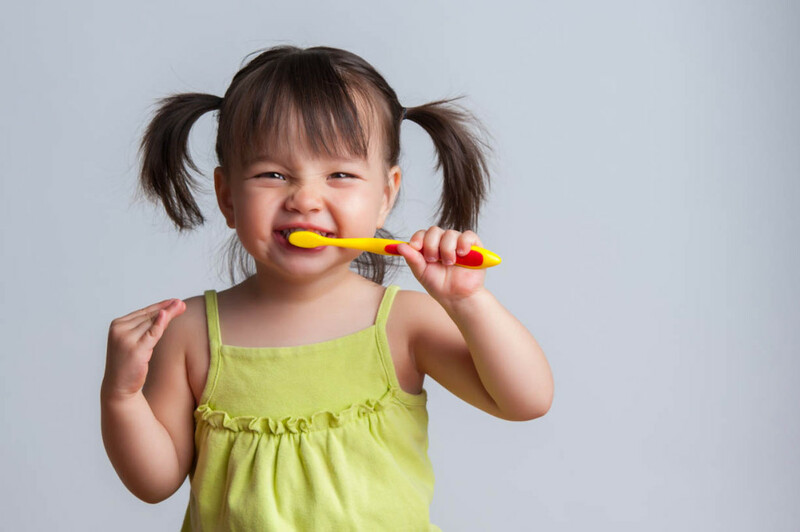 It is important for parents to help their children brush their teeth until they are at least 8 years old as they do not have the coordination to do so on their own. Start by using a soft, age appropriate toothbrush. Electric toothbrushes are fine to use and are preferable to manual. We suggest using a toothpaste that is low foam, low mint and low fluoride. Proper brushing removes plaque from the inner, outer and chewing surfaces. When teaching children to brush, place the toothbrush at a 45 degree angle and start along the gum line with a soft bristle brush in a gentle circular motion. Brush the outer surfaces of each tooth, upper and lower. Repeat the same method on the inside surfaces and chewing surfaces of all the teeth. Finish by brushing the tongue to help freshen breath and remove bacteria. As soon as your child develops two teeth that touch, you can begin flossing your child’s teeth once a day. Parents should continue to floss their children’s teeth until the age of 10 when they develop sufficient coordination to effectively floss their own teeth. Up until this time, remember that the best way to teach children how to brush their teeth is to lead by example. By letting your child watch the way you brush and floss your teeth, it not only teaches them good technique but also reinforces the importance of good oral hygiene. Start with a piece of floss about 40cm long and wind most of it around one of your middle fingers. Wind the remaining floss around the same finger of the opposite hand. Then with a gentle back and forth motion, slip it between their teeth, and form it into a C shape around the edge of the tooth, to sweep away debris. Wrap excess floss around fingers so you can use a new section of floss as it becomes dirty. Repeat until all spaces between the teeth are cleaned. You can also consider using floss sticks or picks instead of regular string floss as it may be easier for both you and your child. Establishing a daily flossing routine is important and you can make flossing part of the nightly pre-bedtime ritual or in the morning before school. For younger kids, you can even integrate flossing with the naptime or nightly story time, because your child can lie comfortably in bed while you floss their teeth. When they are old enough to do this themselves, you can let them floss the teeth they can easily reach, like their front teeth, and you can do the molars in the back, sharing the process and at the same time monitoring their technique. Soon with your support, they will be flossing on their own.